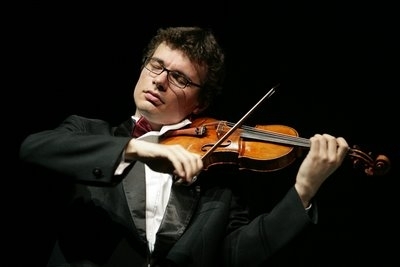 A mature and complex personality, more curious in discovering the dephts in the concerts that he approach, critics say about Alexandru Tomescu, a 33 year old Romanian violonist. He has over 20 awards from national and international contests, over two hundred concerts played and lots of collaborations with great bandmasters. An important stage in his development as an artist was the competitional stage. From 1 december 2002, Alexandru Tomescu is a permanent soloist of the musical bands Radio. Also with the National Radio Orchestra he made many recordings, concerts and tournaments. As president of the Cultural Foundation Remember Enescu, Alexandru Tomescu is involved in many musical projects. In sempember 2008 he was the winner of the Elder - Voicu conest for the Stradivarius violin. In this position he won the rights to play the Stradivarius violin for the next five years.